As we approach the season of goodwill, we’d like to share a wonderful scheme brought to our attention by ALLi Author Member Martin Brown. 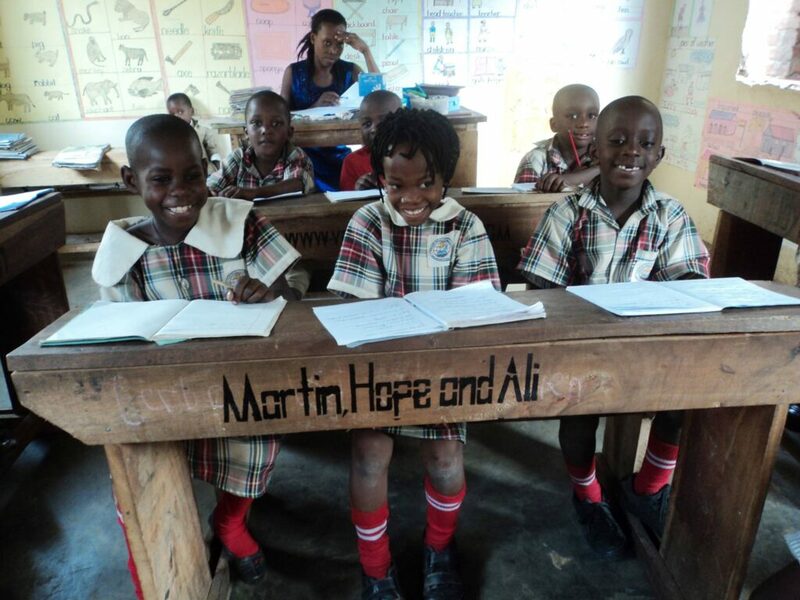 He told us about the opportunity to sponsor much-needed desks in a school in Uganda, on which the donor may choose to have his or her name permanently stencilled, for just £20/US$26. ALLi Director Orna Ross‘s first reaction was “I want one!” – and then, with her marketing hat on, “What a great place to display your author name!” Over to Martin to tell us about the origins of the charity Infancia Uganada, which runs the scheme and how your contribution of a named desk would make a real difference to Ugandan schoolchildren. The book that started it all had nothing to do with Uganda! Several years ago I was working on a book called Spain is Spain. This was a simple project which comprised of me ripping to pieces various aspects of Spanish culture. I then encouraged my students (I was a professional conversationalist at the time) to argue against my attack on their country. The book was published as a bilingual tome, to great controversy and success. During this process I was introduced by one of my students to the Spanish director of Save the Children. I arranged a meeting with this person to discuss the feasibility of opening a charity shop in Madrid to benefit this cause. I had a friend who owned a small shop and was having difficulties renting his property. He told me that I could have it rent-free for one year. I made my proposal to Save the Children and was told that if I couldn’t guarantee a minimum of €5000 euros I couldn’t do this in the name of STC! I was furious and explained to this person that if I gave them €1 they should be grateful. Consequently I decided, along with two friends, to start my own charity, and Infancia Uganda was born. This project is very small and we want to keep it like that. We want to ensure that 100% of donations go directly to a specific project. We began by sponsoring children at a school that was also being supported by another friend of mine, so there was a personal contact. For £300/US$385 per year, we could pay for the education, accommodation, healthcare and food for a child at this private school. Public schools in Uganda simply do not function. The original donors, apart from the three founders, were my students at the time, all of whom were only too pleased to help. We travelled to Uganda to visit the school (100% paid for out of our own pockets, I hasten to add), and we spent a high percentage of the time in tears. There were no desks, dirt floors, and one book per class yet happy smiling faces everywhere. We went book shopping and bought books enough for one for every three kids. This immediately improved the teaching efficiency as the teacher no longer had to copy the contents of the book onto the blackboard each day for each subject. We then went to visit a member of the community called Mary. Mary had three children, each one with severe cerebral palsy, quadriplegic, non-verbal. She had no money, the father had abandoned them and the mother-in-law who lived next door, refused to help or even talk to Mary as she produced deformed children. There was no money for wheelchairs, and so Mary had to carry the children all day. You can imagine the emotional crisis that we experienced just seeing this situation, how could we not help? We immediately started a wheelchair appeal among our growing number of supporters and in three months we were able to provide wheelchairs for the children. Now we also pay for a maid to help Mary all day. The cost of this is just £30/US$38.50 per month. Why, you may ask, am I writing about this for ALLi members? Well, here it comes, the holiday appeal, but this one is a bit different, and a bit special. The school is in desperate need of desks, a lot of desks. We have done a desk appeal before, but this time it’s on a much larger scale. I thought who better to appeal to for money for desks, than people for whom a desk is such a valuable part of their lifestyle: writers? For the measly sum of £20 (about US$26) you can provide a desk for three students. This desk will be engraved with your name, that of a famous writer or a brief message, your children’s names, or whatever you prefer. You will receive, in due course, and bearing in mind that things in Uganda do not move very quickly, a photo of the desk with the engraving and with the children sitting at it. When we tell the children that their desks have been donated by famous writers, their excitement level will increase greatly. I truly believe that this could be inspiring for these children for whom so little means so much. To participate in this desk project please email me at [email protected]. I will then let you know where you can send the money, either to the charity’s account in Spain or to my personal account in the UK. If you are interested to know more about my writing life, here’s a link to my Amazon profile. Thank you so much for reading this and realizing just how easy it can be to really make a difference, and to see the difference that you are making. Martin N. Brown was born in Bournemouth, UK during the post-war, ration-book years. Martin has always loved to write and began his stories at an early age. He considered a career in journalism but, following an interview with the editor of the Evening Standard where he was told that only a small percentage of university graduates who apply are hired, he re-considered. A move to California during the Thatcher years resulted in the realisation that it was possible to write freelance, to be published and paid! The rest, as they say (who are they?) is history. 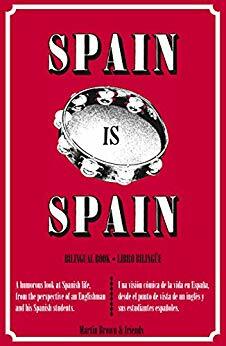 "Spain is Spain" was written after living in Spain for 3 years and is an affectionate critique of the culture there. 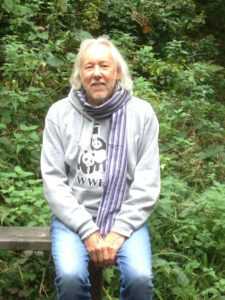 Find out more about Martin Brown and his writing life via <a href="https://www.amazon.co.uk/Martin-Brown/e/B0190J8GQG/" his Amazon author page. I have done this, and happy to share the photo of the desk I sponsored. Would be great to have a school filled with desks sponsored by ALLi authors. Wow…you’re amazing. Thank you for letting us know about this and sharing your story.